Buy Ella's Kitchen Baby Food online. 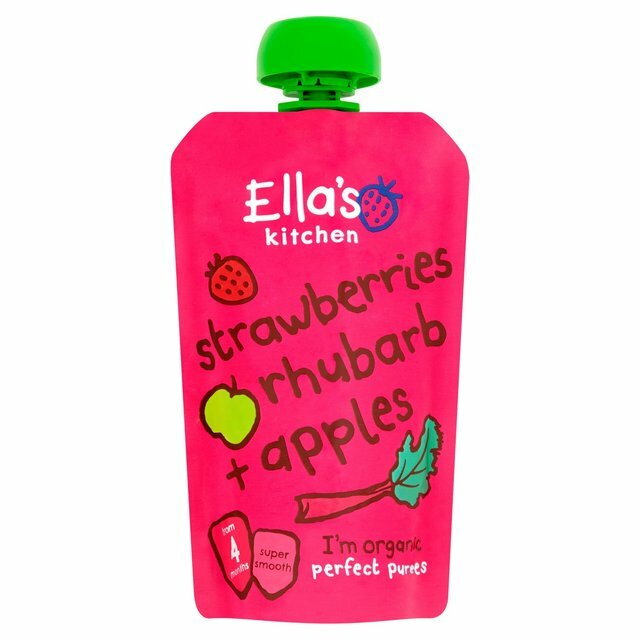 Full range of Ella's Kitchen Smoothies and finger food for toddlers. Hello, I'm 100% organic pureed strawberries, rhubarb + apples - with nothing else added. Who am I for? My ingredients are suitable from 4 months. I'm also great mixed into chunkier food for babies ready for more texture. The Government advises that you don't need to wean your little one until they are 6 months. Every baby is different! My dad made a promise to me and my brother Paddy that he would only use stuff in our products that is full of goodness. I told him everything also has to taste great and he agreed! While we take every care to ensure this product information is correct, products are continually being developed or reformulated, so the ingredients, allergy advice, use and storage content may change. For safety please always read the product and use instructions labels before use and not rely solely on information provided on our website. Keep me in a cupboard. Once opened, I can be kept in the fridge for up to 48 hours. I can be frozen - I'll be a bit cold but still taste yummy! Warning: My cap could be a choking hazard to children under 36 months. Please always keep out of their reach. If I am damaged or look inflated with air, do not feed me to your baby and return the damaged pouch to us.